When Simon Pickering met his future wife for the first time it wasn’t the most auspicious start – she spilt her drink all over him! Alice Hall, 22, was enjoying a night out with friends in the Chesterfield nightclub Back to the Nineties when she, quite literally, bumped into Simon, 26. Although Alice never gave the soggy encounter another thought, Simon tracked her down using Facebook and sent her a message asking her out on a date. That was three years ago and this summer the couple, who now live in Kenilworth in Warwickshire, tied the knot at Shottle Hall in front of an emotional group of family and friends. Proposal: It was in the car park of Frankie and Bennys! We went out for something to eat, but it was a bank holiday and everywhere was shut – so we ended up in Frankie and Bennys, because it was the only place open. We were talking about marriage, but Simon was saying that he never wanted to get married and I got a bit annoyed with him. The next thing I know is he’s gone down on one knee in the car park – it was a total surprise. I had noticed that one of my rings had gone missing, but I just presumed that I had mislaid it. In fact, Si had taken it so he could get the right size. He bought me a ring, but I actually ended up changing it for a different one. They were both from H Samuel’s in Chesterfield. I’ve still got the receipt from the meal! Shottle Hall: My friend also got engaged around the same time and she was looking at loads of venues. She told me to look up Shottle Hall and I fell in love with it just from the website. I knew straightaway that it was where I wanted to get married – and I’d never even been there! Some of the other places we looked at you couldn’t actually stay over, and that was one of the other great things about Shottle – we could all stay the night. It was our dream venue though, everything about it was 100 per cent perfect. Ceremony: I used to be a really good ice skater, in fact I was the British Champion in my category for a couple of years when I was 13 or 14. I gave it up because I had to get up at 4.30am to practise and go every night after school. It was just too hard. I was very close to my coach, but he moved to Canada and I hadn’t seen him for ages. My mum and dad arranged for him to come to the wedding and as I walked down the aisle I spotted him, so that was a fantastic surprise. During the ceremony my mum read a poem she had written about us both and she got emotional and that set me off too. My sister sang a song and played the guitar too. Simon loves singing and has actually recorded some of this songs. As a surprise for him I asked them to play his version of Signed, Sealed, Delivered while we signed the register. I don’t think anyone else noticed it was Simon singing – but he did. Then after the ceremony Si and I walked back down the aisle to Your Song from the film Moulin Rouge. Dress: My dress was really cheap, it was under £300, but I really loved it. My parents live in France and I found a great website with loads of dresses on and asked mum to pick her favourites and I picked mine. It was amazing because we ended up picking all the same things – and her number one choice, was my number one choice! I ordered if off the internet, I just sent my measurements off and the dress arrived. I tried it on at mum’s house in Chesterfield and found they had forgotten to put the buttons on the back, so it had to go back. When it returned they had added loads of sequins and so it looked even nicer. I had to have it taken up – because I’m only little – but that only cost about £20. About half an hour before I walked down the aisle I managed to get black marker pen on my dress – the bridesmaids had signed my shoes! Shottle’s wedding co-ordinator Emma had to safety pin an extra pleat into my dress to hide it - she was fab. 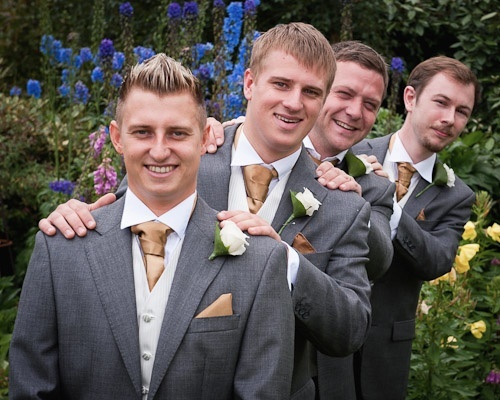 Suits: Simon, the best man, the two groomsmen and both dads all wore normal grey suits and silvery grey waistcoats, with cravats that matched the bridesmaid’s dresses, in a coppery colour. They were hired from Lady Fair of Matlock. My six-year-old Joshua wore chinos and a smart white shirt. I did get him a lovely hat and scarf to wear – but he wouldn’t put them on! 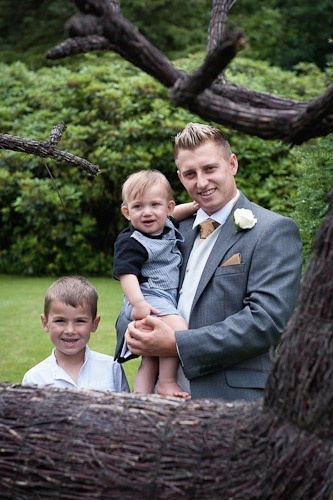 Alfie had an all-in-one suit with a little bow tie printed on it! Bridesmaids: I had my sister Clare, Simon’s sister Liz and my friend Gemma. 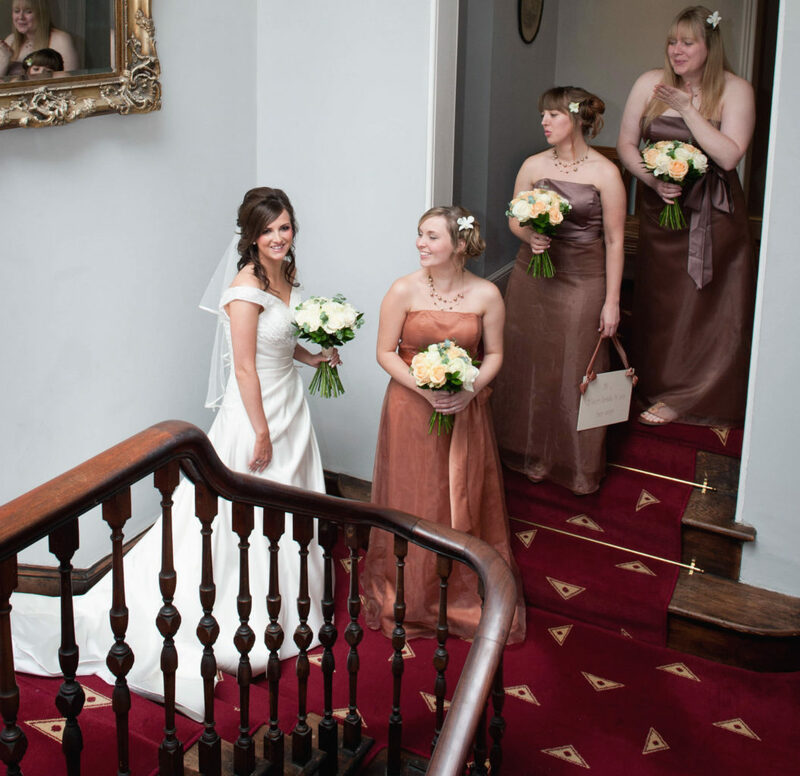 They wore strapless dresses in a coppery colour and the top half was satin and the bottom half was organza. I got them off the internet too. Hair and make-up: I had my hair done by Mark Roberts in Chesterfield on the morning of the wedding. He does my hair anyway, as well as Mum’s and Clare’s, so I completely trusted him. I did my own make-up to save cost, but also because I wanted to look natural and not like someone else. Some years ago I had a makeover and I didn’t feel like myself afterwards, and that’s not how I wanted to feel on my wedding day. Flowers: Heart and Flowers, in Chesterfield, did my flowers. My bouquet was hand-tied with white roses and diamantes. The bridesmaids carried similar bouquets but theirs were peachy coloured roses. The buttonholes and corsages were all white roses too. The bridesmaid’s bouquets went into vases for the table decorations, but my bouquet was a bit too big for the vase and it tipped over and spilt water all over my dress. I was fortunate that because it was made of satin it ran off it and didn’t leave a stain. Reception: We had 70 guests in the day and ate our wedding breakfast in The Orangery. I made the table plan myself and got all the bits and bobs for it from Paperchase. Simon named the tables after planes – because he works for Rolls-Royce, so we had Spitfire, Lancaster etc For our starter we had broccoli and stilton soup, pork tenderloin and dauphinoise potatoes for our main and Bakewell pudding and ice cream for dessert and it was all absolutely lovely. We also had a candy buffet which one of my friends did for me as a wedding present. She has set up her own business called Sweet Candy Buffets and it was brilliant. 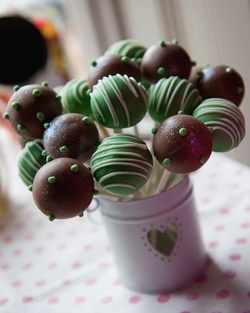 I also had cake pops from Love Cakes, in Chatsworth Road, in Chesterfield which were gorgeous and all went really, really quickly. My favours were little wedding chairs with a name tag attached to them. You had to lift the seat up and there were sweeties inside like jelly babies and liquorice allsorts. My dad, Simon and the best man Adam all did speeches. Adam, who is Simon’s brother, was really emotional and he brought a tear to everyone’s eye. Evening: In the evening we had 30 more guests and Tenacious DJ who was really very good. Our first dance was to Come What May from Moulin Rouge and it seemed to go on for ages! I had an entertainer who mingled with the guests and did a fire-breathing show outside. We also had Karaoke – as Simon is a massive fan - and he was up there singing his heart out quite a bit. My bridesmaids and I sang the Wilson Phillips song Hold On which is used in the film Bridesmaids, so that was quite funny. We had a cheese cake and instead of having a buffet everyone had cheese and crackers, which worked out really well. We also had a video booth which was set up in the library. The company is called Pure Steel Productions and they came over from Rugby, which is near where we live now. Basically people were invited to leave a little message for us and there were loads of props they could use during the recording. Some of them were hilarious! Cake: As well as the cheese cake we had a wedding cake made by a family friend. It was four layers made up of all different kinds of cake – fruit, chocolate fudge, cookies and cream and carrot cake. It got slightly damaged in transit, but still tasted fabulous. Photographer: We had Frameworks Media, from Stoke, as my mum knew them. They were really good and gave us a preview of the pictures just a couple of weeks after – we were thrilled with them. Honeymoon: We went on a family holiday to stay with my parents in Brittany for 10 days straight after the wedding. And then in September we went to Menorca with Simon’s family.